Newbie and savvy both computer/laptop users have a very bad habit . Whenever after reinstalling Windows or buying a new computer/laptop , users do not change the folder location where all your downloads , images , important data and works gets automatically saved . I mean ” My Document ” ” My Pictures ” etc . I always change default folder location after clean installation . Definitely here you would ask me that why it is mandatory ? Because Windows might be corrupted any time and all your important stuff gets ruined and you have to regret , therefore it is so much necessary . If you are facing this problem then Wondershare has designed an awesome software named Wondershare Live Boot to tackle this problem . And the plus point is that Wondershare Live Boot retail worth 60$ is today’s gift from Wondershare.com . Before grabbing a free serial key to activate it let’s see what Wondershare Live Boot can do for your important and hard drive ? Wondershare Liveboot 2012 serves your computer and important data three ways , It recovers Windows and your hard drive . And recover removed, formatted, even corrupted files . And the best feature and it is especially designed for lazy , reckless or irresponsible people that do not save license , serial or activation codes in a safe place , With the help of this feature you can reclaim Windows , Office or any other software license keys to reinstall for free . It is my favorite one , partition and clone your hard drive to speed it up . We can say in other words that Wondershare LiveBoot 2012 is your trusted “LifeSaver” with the complete and foolproof computer/laptop emergency solution . It has a unique and latest WinPE 3.0 technology , it means , there is no hardware compatibility problem . This boot disc gives a complete solution set for all Windows crash and booting problems including booting failure, virus infection, blue/black screen etc . This boot CD/USB for Windows can help to reset Windows password when you forget the login password and find Windows or Office product key when you want to reinstall them. This bootable disk can rescue any data from your internal/external hard disk or partitions no matter deleted, formatted, or whole disk corrupted, including documents, archives, emails, photos, videos, and audio files. This DOS boot disk offers complete disk management solutions including partition management, and disk/partition cloning, disk/partition wipe, and more. It boots up a computer if it’s infected by virus. It recovers fast from crashes such as blue screen and a black screen. It does fix booting problems, random crashes and missing file crashes such as ‘ntldr is missing’, ‘bootmgr is missing’, etc. It repairs partition table, corrupted registry, virus-infected registry key value, and crashed MBR even it’s infected by virus. It recovers system files with 1 click. 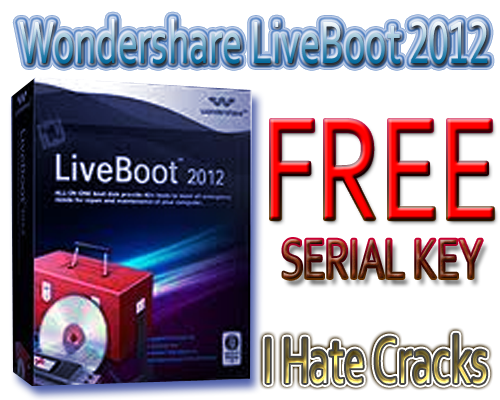 60$ is the normal price of Wondershare Live Boot 2012 for per serial key to activate its full version . But with the help of 100% off coupon code you can grab a serial key for free . So readers follow these instructions to get a free serial key . Visit the Giveaway page and enter this coupon code and your name and a valid email address . Please write all details manually , don’t do copy and paste . You will instantly receive an email consist serial key and download link . Therefore check your mailbox .